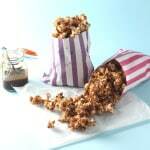 A sticky, sweet and indulgent salted caramel sauce made with coconut sugar and coconut milk. Discovering clean eating has quite literally been life changing for me. Gone are the gluten induced stomach cramps and sugar induced cravings and crashing. It has opened myself and my family up to a whole different way of eating with some ingredients which we didn’t even know existed! However (there had to be a but didn’t there!) after several months of eating this way my sweet tooth reappeared and I really began missing desserts and treats. Although grabbing a handful of nuts or a square of dark chocolate after dinner is now the norm rather than biscuits or crisps, we all still need the odd indulgent sinful snack from time to time. 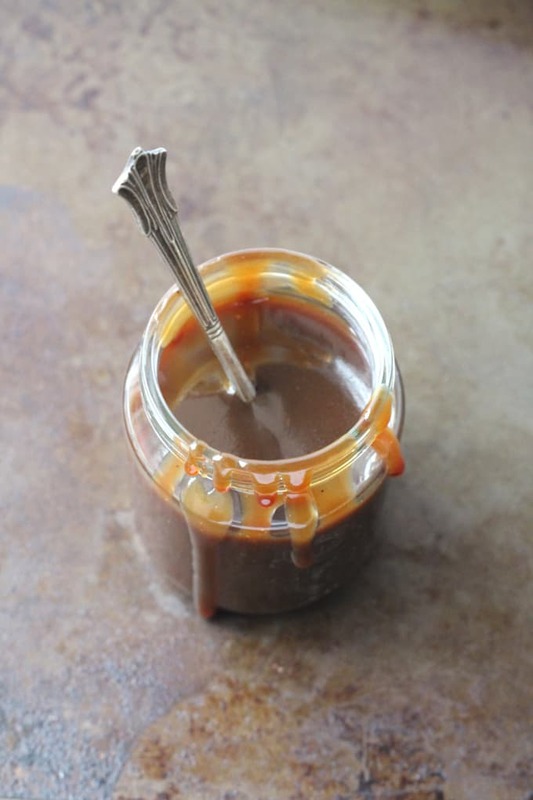 Enter this Salted Caramel Sauce and all is right with the world again. Salted caramel has been a favorite of mine for years now, whether its salted caramel cookies, salted caramel cake, brownies, biscuits…you name it, I’ll eat it! 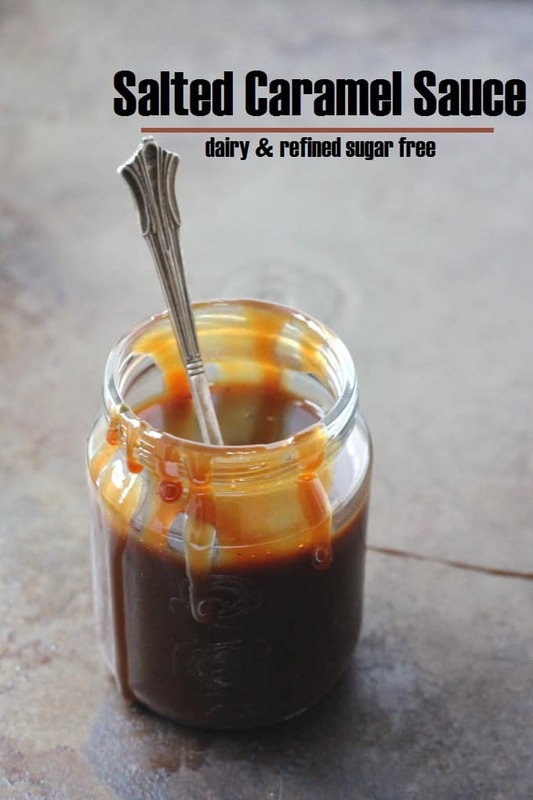 When I realised that I could make a caramel sauce with no dairy and no refined sugar I nearly self-combusted with delight! This sauce is made using coconut sugar rather than refined white or brown sugar. Now although coconut sugar is “healthier” than normal sugar it is still high in calories with little nutritional benefit. I wouldn’t have it every day but do use it occasionally for a sweet treat or in a dessert if we have people round for dinner. And with Christmas just around the corner I do have some special recipes coming up where I plan to use my salted caramel sauce. Look out for the first one later this week! 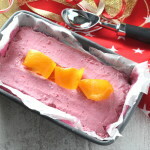 Do you have any favourite “clean” or paleo desserts? I’d love to try out some new recipes so do let me know! Place the coconut sugar and water in a pan over a medium heat. Stir gently until the sugar has dissolved and let it bubble for 2-3 minutes. Pour in the coconut milk and keep stirring until it has fully combined. Turn down the heat and allow the sauce to simmer for 10-15 minutes until it has thickened. I used canned coconut milk and followed the instructions “to the letter” and the sauce was the consistency of water. Total fail. 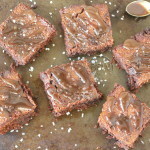 I LOVE anything and everything “salted caramel” so delighted to have found another recipe which a healthier take on it. Delicious. Can’t wait to try it with your brownie recipe on the blog. So probably maple syrup would make it a more refined sugar-free recipe. I believe the issue is that canned coconut milk usually has guar gum in it. That is a natural thickener, so if you are using a brand without gum in it, that is probably the reason it is not thickening. This coming from someone staring down longingly as we speak at the brown water that will not thicken 🙁 . Going to add some agar-agar or gelatin and see if that works. My IP lava cake is waiting for its caramel!! When does it turn golden brown and why won’t it thicken? Mine has been simmering for 15 minutes now and it is clear as water and has not thickened at all. I used regular sugar, can that be my problem? Hi Agnete, I’ve only tried this with coconut sugar so perhaps that’s why its not working. I’m sorry! I tried this with coconut cream – slightly less than the recipe called for – and a liiiii-ttle almond milk, and the result was dreamy! Such an effortlessly indulgent recipe. Thanks for sharing! Sounds delicious! So glad you liked it! OMG….made this for Halloween. YUMMY! I made caramel applea, caramel corn, and 2 days later, chocolate caramels. Next time I will use full fat coconut milk to hopefully get a thicker product. Hi, I just made this tonight and it never really thickened. I was wondering if you used full fat coconut milk or coconut cream, because there is a difference of labeling on the cans (at least in Canada)? I am hoping as it cools it will get thicker because right now is caramel liquid. But it smells delicious and I thank you for making a DF version. Hi, yes I used full fat coconut milk from a tin. My sauce always thickens more once its cooled so hopefully yours should do the same. If it doesn’t work I would suggest to try another brand of coconut milk. 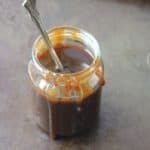 Do you think this caramel sauce would keep a good consistency if kept in a warm crockpot after? I want to have “Apple nachos” at a party and need a caramel sauce that will stay warm for a while. Hi Sarah, yes I think it would stay a good consistency on the lowest setting in a crockpot. Let me know how it turns out! Is there a specific brand of coconut milk you recommend? In the comments I know you mentioned the carton or the can of coconut milk and I am not sure which one to use. Thank you. Hi Linda, for this recipe I would also recommend the canned coconut milk as it is a lot thicker than the carton variety. Presuming you’re in the UK I love Lidl own brand and also Sainsburys own brand as they seem to be the thickest but any canned brand should work just fine! Canned coconut milk and the kind you drink are completely different products. The canned type is what is usually called for in recipes. I find it in the baking section or near the Thai food in the international section. FYI, coconut sugar is no healthier than any other sugar, so this should definitely be a treat. 🙂 thanks for the vegan recipe! Thank you Lilly, so glad you enjoyed it! Used your recipe, but the sauce never really came together. It was sort of think, but just a cloudy sugar mess. Any troubleshooting for why it didn’t carmalize? Hi Megan, I’m sorry to hear it didn’t work for you. I’ve made this sauce several times now and that’s never happened to me so I’m trying to think what might have caused it. Did you use full fat coconut milk from a tin? could this delicious looking sauce be used in ice cream please. Absolutely! It would be amazing on ice cream!! Ciara, this is the recipe Ive been looking for!! I love salted caramel sauce, but my tummy doesn’t love dairy! I just bought some coconut sugar, so this is getting made ASAP! Oh brilliant! Really hope you like it! Why doesn’t it work with any other plant-based milk? I tried it with hemp milk and it was a total fail. It never thickened! Very disappointed. Sorry Camille I haven’t tried it with hemp or another plant based milk so can’t advise you on that. My only guess is that the fat content is probably nowhere the same, so it won’t reduce down and thicken like coconut milk. Looks yummy! Does the coconut milk need to be full fat or is light coconut milk fine? Hi Sonya, I have only tried it with full fat coconut milk so cannot tell you if it would work ok with light. I followed your instructions (& ingredients) exactly and after 45 minutes the sauce still has not thickened. Im taking it off the stove now and hoping it will thicken as it cools.. Not sure what i did wrong here. Did it thicken as is cooled Rebecca? This recipe has always worked for me but I wonder if the brand of coconut milk may affect how well the sauce thickens. Also, was it canned coconut milk and not the carton type? There is a degree of fat in almond milk, as well. I wonder if it would make a viable substitute. I see that you haven’t tried other milks, but as a guess, what do you think? I really have no idea, I’m sorry! But if you try it please do come back and let me know! Based in the comments, you may need to clarify that the carton type coconut milk ( or any other “drinking milk” substitute will not work. You need the canned thick coconut milk (light is probably fine, though it may be slightly less thick and creamy); you’re using it as a substitute for heavy cream, so drinking type milks won’t work. I don’t think the kind of sugar you use would matter as much. Does it taste coconutty? That is the number one question because Mr M cannot stand coconut! There are so many recipes that I have tried, to get around our lack of dairy, but the coconut ones just don’t get past him!!! Oh gosh, that must be so hard if you are trying to cook dairy free but can’t use coconut milk. I don’t think this tastes coconuty but then again I love coconut so maybe I don’t taste it so much. Maybe give it a try and see what he thinks! this is perfect, just perfect! 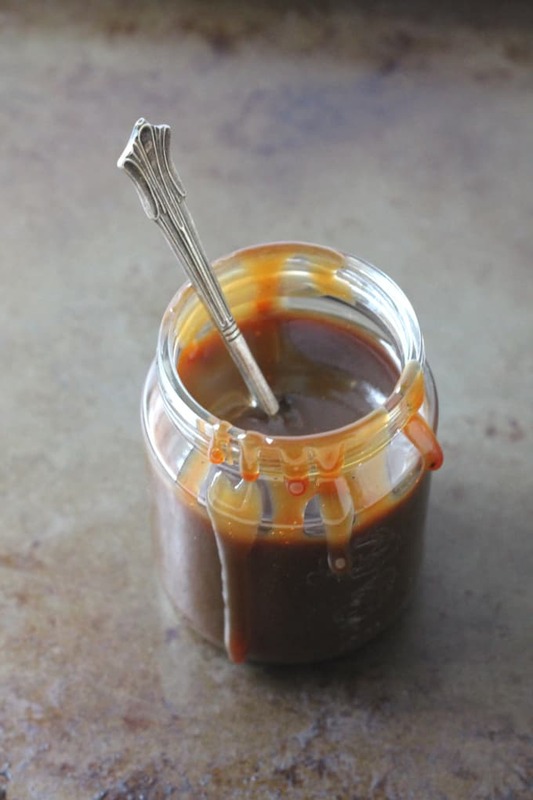 I’ve been making & avoiding my salted caramel sauce as the sugar just gives me a headache & has me craving more & more – I will be sure to try this! You should definitely try this then. Coconut sugar definitely gives me far less cravings. And I never wake up with those horrible sugar hangovers anymore. OMG yes!! Sticky Toffee Pudding is on my list to make very very soon. This sauce would be perfect! Where are you based Howie? I have found it very easy to get coconut sugar in the UK. Most health food stores stock it and you can buy it online and on Amazon too! No vegetable broth? That’s just crazy! Or maybe they just all make their own?! Fingers crossed you manage to find some coconut sugar! Wow – that looks especially sinfully good! Salt and sweet together are such the fantastic combo! And of course I’m happy to see it with a more healthful twist! This looks delicious, I’m looking forward to seeing what you make with it later in the week. I have to admit that I’m still very much into cooking with “bad” foods, but seeing the lovely things on your site (and a few others) is making me think that I should give some of these alternatives a go. Where do you get your ingredients (e.g. Coconut sugar) from? I buy my coconut sugar in bulk from Amazon. But if you fancy giving it a go then maybe try a small bag first and see how you like it. I use the Biona brand and you should be able to get a small 250g bag from most health food stores!